Hot on the heels of their record breaking antics over at Spotify, Daft Punk have scored their first ever Official UK Number One Single with 'Get Lucky'. Opinion has been divided over the collaboration with Nile Rogers and Pharell Williams. Many older Daft Punk fans see it as a bland sellout with none of the abstract, quirky edge of their previous work, but they have been rewarded by the mainstream with the runaway success of the retro catchy disco track. The song has already broken Spotify streaming records, with Will Hope from the company saying the album would be "the biggest" this year. Last week, the French duo entered the UK Singles Chart at Number Three after just two days of the song being on sale. Now, after notching up sales of 155,000 copies this week, they have finally nailed the top spot, according to the Official Charts Company. They knocked Rudimental off the top spot while Will.i.am and Justin Bieber's '#ThatPower' is at Number Three and 'I Need Your Love' by Calvin and Ellie Goulding is Number Four. Emeli Sande remains in the Top 10 for a 63rd consecutive week with 'Our Version Of Events' at Number Five. 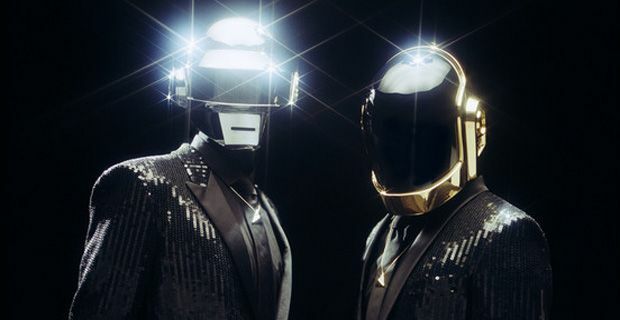 Daft Punk have shown extraordinary skill in riding the wave of ‘EDM’ trendiness in America. They could so easily have stayed a slightly bizarre crossover act from a few years back, but they have shown immense strategic savvy in managing to climb aboard the stadium train in the States and have now coincidentally started working with big name crossover artists across the pond and got a new album in the pipeline. Daft is certainly not a word that springs to mind – or Punk for that matter. In all fairness – while not exactly a challenging piece of work, it will make for a sun soaked and sentimental summer anthem – there can be no doubt of that. All we need now is a summer!